The City of Richmond has an ambitious vision to improve online services for its customers through a multi-year digital strategy. Over the past several years, the City has upgraded and replaced several business systems on a unit-by-unit basis, each time choosing the best available solution. However, this resulted in City customers having to create and remember logins for multiple websites in order to access the full range of online City services. After undertaking significant “under the hood” work to establish an identity management system with single sign-on (SSO) capabilities, the next stage of the Strategy was to launch one consolidated place for customers to access all of their information and online services. The City of Richmond selected Radical I/O to partner with them on this exciting Smart City project, which included numerous data integrations and designing and implementing the centrepiece of the Strategy: a customer-facing web portal. We first needed to understand the City’s vision for the solution and their goals for this first year of the project. During the Discovery Phase, we examined their existing systems, explored best practices in online city services, and undertook a series of meetings with City stakeholders to understand their (and their customer’s) needs. By the end of Discovery, we had outlined a technical solution and architecture in keeping with the City’s current infrastructure for the customer-facing web portal, using modern client-side web technology combined with two layers of APIs. We recommended the best technologies for the project with future-proofing and return on investment in mind. In parallel, we worked closely with the City to undertake a detailed research and ideation process that explored key user groups, developed user personas, and mapped user journeys to inform recommendations on the user experience of the portal. The design team produced a set of initial designs, primarily as wireframes but also with some branded UI inspirations, that: incorporated a wide range of City services; identified opportunities to personalize the information being displayed to users; and suggested what the future of municipal online services could look like. The team then went through a number of rounds of prioritization to reach an achievable scope for the current project timeframe. 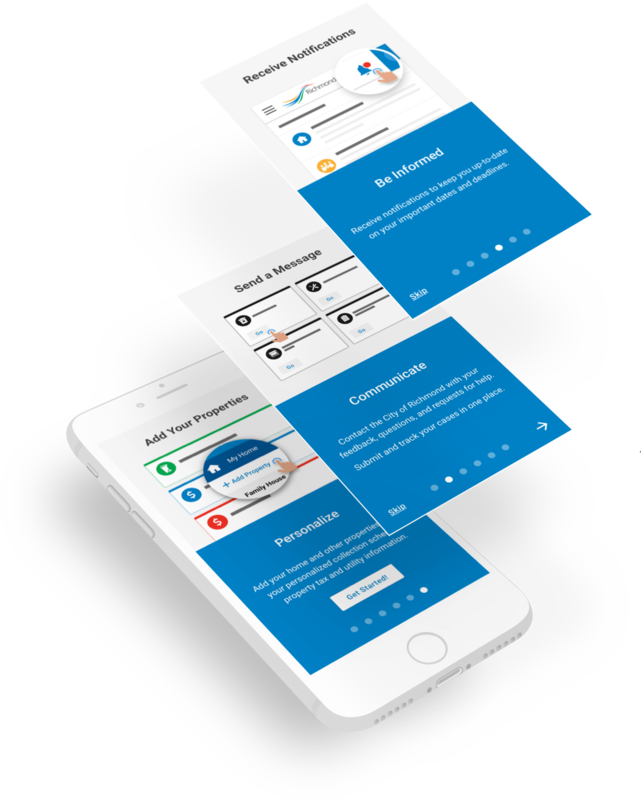 The outcome was MyRichmond, a suite of online services presented under a single City of Richmond login account with a clean and intuitive user interface. MyRichmond focuses on the customer (particularly residents and local business owners) and provides information and services in a user-centric way that makes more information than ever before easily accessible. 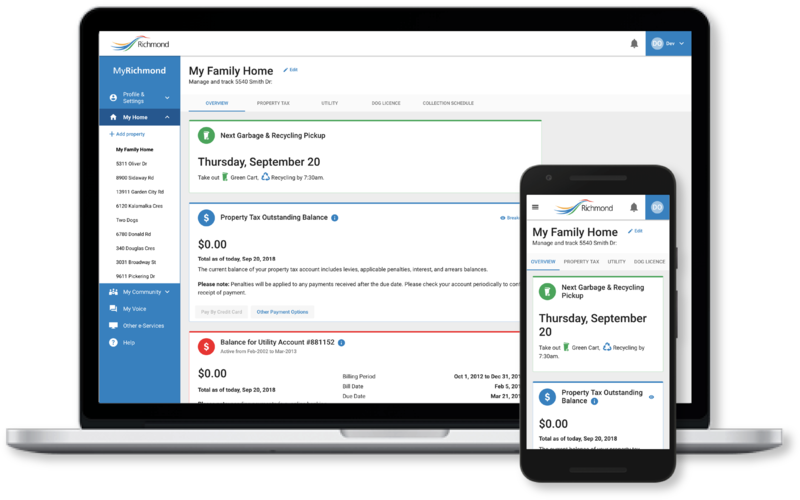 MyRichmond brings together important property-related information including property tax, utilities, dog licensing, and garbage and recycling collection schedules into one My Home section. MyRichmond promotes two-way communication between the City and its residents by incorporating features to raise issues, report problems, and ask questions in the My Voice section. The My Community section provides a highly intuitive search/filter interface for users to find local recreation programming and events, as well as manage their own registered recreation activities. Users can add and update their contact information in the My Profile section. 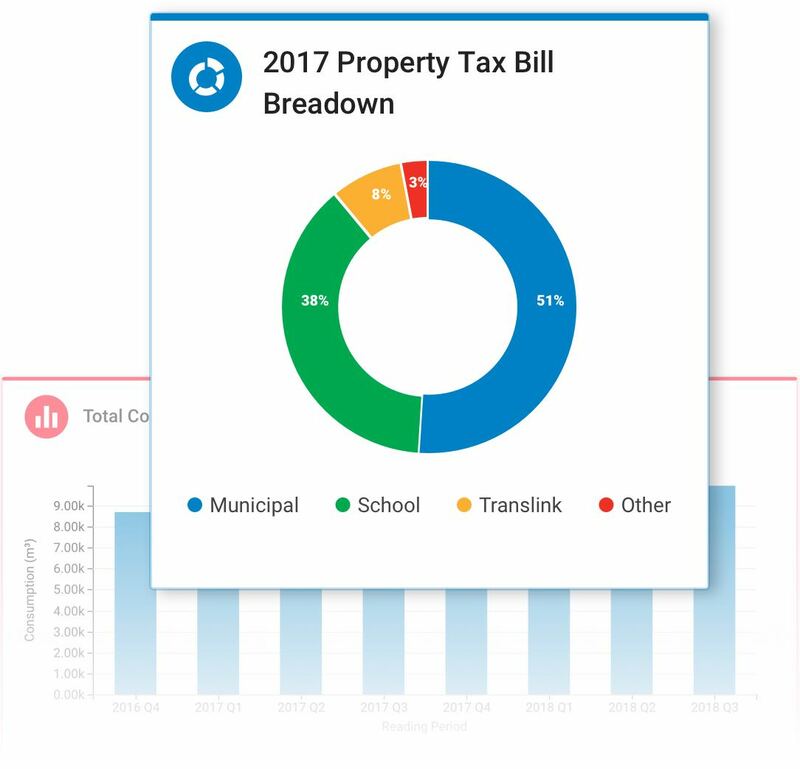 MyRichmond also introduces the foundation of a notification publishing service, which currently provides in-app notifications to users based on their preferences - receiving notifications about property tax notices and deadlines, utility payment due dates, dog license renewals and City announcements. Prioritize information that can be personalized and is uniquely relevant to each user (customer). Maintain a flexible yet consistent design for the various different types and sources of information MyRichmond will incorporate now and in the future. Make it easy for a user to immediately understand and be able to intuitively use MyRichmond, by presenting key data in clear and meaningful ways via icons, charts and tables. Ensure that MyRichmond is as future-proof and scalable as possible, by designing an information architecture as a self-contained ‘modules’ containing groups of related features. Performant, secure, and extensible data APIs that exposes functionality and data from the City’s departmental applications. A system of enterprise software integrations to interact with departmental applications and existing City services. Reduced the need for queries to departmental applications as much as possible while ensuring current data is shown to customers at all times. Built out a continuous integration (software build automation) pipeline, along with a containerized deployment system to make deployments less painful, and worked to match the specifics of City infrastructure. Prepared for mobile app integration of data services and notifications via our common API approach and via the publish-subscribe architecture in notifications. Introduced a high-performance search infrastructure that makes it easier for citizens to find local activities and events. Provided two separate administrative tools for use by City staff to manage MyRichmond: an App Settings behind-the-scenes tool for managing the information displayed in MyRichmond; and a Notifications Admin tool for managing notifications. We are delighted with the MyRichmond personalized web portal, which will provide online digital services for City of Richmond customers for years to come, whenever and wherever they wish. Radical I/O was a great partner to work with in creating the vision of MyRichmond and brought their considerable strength in exploring and implementing innovative new solutions to create a strong, performant, and engaging solution for the City. We appreciate the effort and care that Radical took to understand our needs and our existing infrastructure, systems, and deployment requirements. The team showed great creativity and technical expertise, and were enjoyable to work with. We look forward to working together again soon! A modular approach to architecture and design for the addition of new features in future. A personalized platform, driven by flexible APIs, that focuses on users as individuals. The beginning of a significant culture shift within the City towards a customer-centric perspective. A solution that fits into and has helped to evolve the City’s eco-system towards ambitious and exciting Smart City goals. The City of Richmond recently received a Smart 50 Award in the Governance category for its initial development of MyRichmond, recognizing smart cities projects. Richmond is a culturally diverse and dynamic urban community centrally located on BC's West Coast, in Metro Vancouver. The City of Richmond aspires to be the most appealing, liveable, and well-managed community in Canada.